TORONTO – July 14, 2011 – Setting a new standard for superphones, Motorola Mobility Canada Ltd. introduces the Android™-powered Motorola XT860 4G, available soon exclusively at Bell Mobility. The mobile powerhouse delivers uncompromising web, email and media content to Canadians and will be Bell’s first superphone equipped with a full slide-out keyboard. The individuals using this device will become digital trailblazers, channeling the strengths of the device to power through their day. Among the many strengths of Motorola XT860 4G is the device’s dual-core 1GHz processor, enabling users to simultaneously run apps, stream media, talk, email and surf the web, all without delay. A permanent number row on the top of the thin QWERTY keypad lets users type and text faster and more accurately without the need to always hit the ‘ALT’ button. And with a brilliant 4.0-inch qHD touchscreen display, Motorola XT860 showcases clearer photos, Web pages and video content. 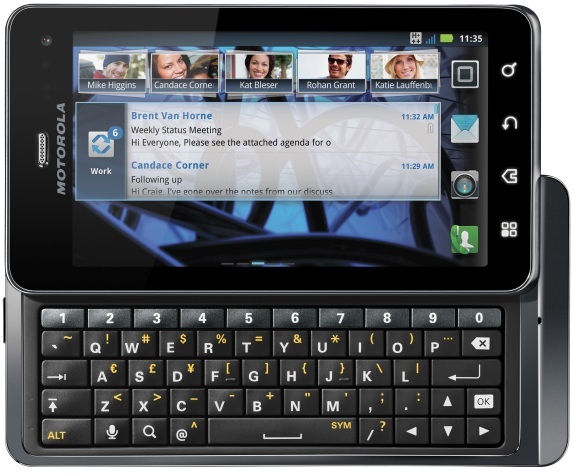 With Motorola XT860 4G, individuals can stay informed of up-to-the-minute events, bargains, restaurants and other opportunities that are in their vicinity and match their preferences. Using Motorola’s Social Location technology, local information is compiled from thousands of the Internet’s most powerful websites, and then filtered based on context and past behavior before it is pushed out to the device enabling people to explore new shops and restaurants, find friends who are in the same area, and call for reservations or tickets with the click of a single button. Information filters are updated based on response, and relevant data is only sent to the user when he or she is looking for it, without being intrusive. Motorola XT860 4G leverages smart docking technology, offering tailored experiences based on home, office, bedroom or car dock settings. As users transition environments throughout the day, Motorola XT860 4G adapts its features automatically based on the dock it’s connected to and pre-defined settings. For example, when a user connects his or her Motorola XT860 4G into a dock in the bedroom, the device automatically adjusts to pre-defined settings, such as a lower screen brightness, alarm clock and homescreen news updates. When moved from the bedroom dock to the car dock, Motorola XT860 4G can automatically display GPS navigation and stream a pre-selected morning radio program, giving users the experience they desire as they transition throughout the day. Motorola XT860 4G empowers users to manage business instantly, intuitively and securely. Never be out of the know with work issues by keeping up with corporate email sent directly to the device. Users can keep track of their schedule through a full calendar and they have the ability to see if colleagues are busy and initiate new meetings. Users can download, review and edit documents, presentations or spreadsheets with a pre-loaded Quick Office. Also, with the built in Citrix Receiver application, business users benefit from simple, secure access to business applications, desktops, and IT services. The large 4.0-inch qHD display makes it easy to see the document with little scrolling or panning. Additionally, the five-row QWERTY keypad makes it easy to quickly type up responses to emails, and there’s no need to wonder if the IT department will approve Motorola XT8604G, as the device is fully business ready with security, password protection and encryption requirements. Motorola XT860 4G will be available exclusively to Bell Mobility clients this summer.